Sal Maggio became a salesman at the wee age of four. His older brother was hawking candy bars for a school benefit, and the toddling Maggio could not resist his natural predilection. The future President of Salco Distributors (www.EZDropShipper.com) started selling Hershey's and Snickers bars door to door, and began experiencing his first sugar highs in the world of business. Elderly men and women could hardly open their wallets and purses quickly enough for the precocious lad. "At the time, I did not even understand money because I was so young," Maggio recently said, while sitting in his headquarters in Largo, FL. "But I knew early on that I was getting a sense of enjoyment out of the activity." Indeed, the seeds were sown then for Maggio, who would eventually become one of the most successful executives in the wholesale industry. Throughout grade school, he sold everything from pens to newspapers to first aid kits to seeds to greeting cards: all door to door. At the age of 14, he founded his first licensed business, called Maco Distributors. He sold novelty items to his friends, who in turn sold them to their friends. His career in wholesaling was already underway. "It was like a word of mouth venture that spread throughout the schools in the area," he said. During the spring of 1982 as a high school freshman in Rockford, IL, he put together a rock concert from scratch that drew around 3,000 attendees. He lost a little bit of money, but was not discouraged from being a rock 'n' roll businessman. Though he was only 16 and too young to get into clubs, Maggio began to manage a slew of local rock bands, and even rented out his first office away from home. "When you are a kid, you do not know the word 'no,'" he said. "It was what I was into at the time, and I did not think anything could stop me." At 18, he got into real estate and was the youngest board of directors member ever for the Rockford Apartment Association. From there, Maggio began his journey into the serious wholesale marketing world. Fast forward to 1993, when he started Salco out of a garage in Largo. About a decade later, Maggio would be overseeing the operations and development of a business that requires a huge warehouse. "We have definitely grown from the garage," he said. "I am a graduate of the school of hard knocks. Everything I have learned, I have learned on the job, so to speak. Looking back at it, I would not do it any other way. It has allowed me to adapt as the world of business changed. For instance, I think I have adapted to the Internet at a high level." Maggio and his expertly trained staff are fresh off a late fall relaunch of www.ezdropshipper.com. It changed the way they do business considerably. The alterations were based on customer survey results, and were designed to address the specific needs of both the company's etailing/eauctioneering clients, as well as the brick and mortar customers. In one example, customers can return all products within 30 days from purchases made at the website. Perhaps the most striking difference lies in the fact that the site no longer requires a monthly membership fee for dropshipping clients. While the premium service still includes a fee, the basic membership does not. "We are also offering tiered pricing now," Maggio said. "This will help pick up some of our brick and mortar customers. So now if you want multiple cases or something along those lines, you can get price breaks. In the past, we only had one price. We are trying to squeeze every penny for the customer. We want to pass on the savings. Our goal is to offer our products at the same price our clients would pay if they went direct to the manufacturer or marketing company." The shipping charts at EZDropShipper.com have also been simplified and made easier to understand. The firm now offers preloaded websites for As Seen On TV product lines. The company works with around 80 percent of the leaders in the direct response television category. A "Drop Shipping 101" section has also been added to help new retailers understand some of the advantages of working with Salco/EZDropShipper.com. "We have really done a lot to change the look and feel of the website," Maggio said. "As one example: in the 'before' realm, in order to see a lot of the products, you had to first log in. But now, you can get a chance to preview what it could mean to become a free or premium member right off the bat. That has been beneficial. We are also offering new product lines. We just entered into a product agreement that will increase our offering by around 4,000 items. We are excited about a new tools line that we will be featuring from a division of Snap-On Tools, as well." An upsell feature was also added to the new site. When clients are checking out their shopping cart, they are offered additional products, often at special prices. Maggio said that one of the benefits for the customer is that purchasing the upsell items rarely increases the cost of shipping. As part of the hosted shopping cart offering to retailers, Salco even plans to offer the chance to put the upsell feature on their sites for customers. Maggio outlined a handful of other areas where his company plans to increase investment this year. Among them include a higher level of organic and paid search engine optimization, more opt-in email campaigns, a greater breadth of strategic partnerships and some tests in the affiliate marketing territory. "One thing we really want to get better at is organic search marketing," he said. "It is an area that we hope to improve on this year. And one thing I want to point out is that anybody who works here is in the customer service business. It does not matter if they are in telesales or another area of the business. Our customer service style is to listen, understand needs and react upon them." The relaunch should also pay dividends for the database of 20,000 past BTB customers that Salco/EZDropShipper.com has attained. When new products arrive in the warehouse, the company marketing team quickly assembles a text and image laden message to inform customers about the new offering. Weekly product updates are expected to occur in 2007. The firm also uses email to confirm orders for customers. Maggio said that attention to detail is one of his company's highest priorities, when it comes to satisfying a client's product and delivery needs. "The website has a whole host of features related to customer service," Maggio said. "There is a whole area where they can look at all of their orders and drill into them. They can see if they have a balance due. We began offering PayPal in November to complement the major credit cards we accept. We are highly interested in offering the Bill Me Later option in the future. We are always interested in making it as easy as possible for our member customers to get the products they need." Salco has always prided itself on being able to ship directly to consumers for its etail or catalog clients. In many cases, the two step process (as opposed to three or more steps) cuts cost for everyone involved, and expedites the fulfillment process. The company has been recently taking this philosophy into the wholesale side of its business. Salco/EZDropShipper.com has been working on becoming more of a virtual channel between manufacturers and retailers, in order to enhance the delivery process. "It will help us better meet the needs of our brick and mortar customers that I mentioned earlier," Maggio said. "We have already been meeting our etailers' needs with our dropshipping program, and this will help us better address the other side of our business. Eventually, we plan on developing two different sites for each kind of customer. 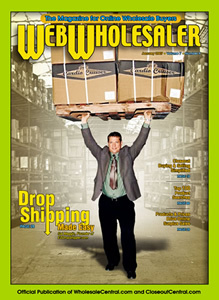 We plan on launching EZWholesaler.com in the second quarter of 2007 for that very reason. Having two separate sites will allow us to have more specific content for each type of customer that we serve." Some of the top performing products for Maggio's firm have consisted of items such as a bark control collar for dogs, an 11 piece miracle knife set and the MXZ handsaw. What has been most interesting is the emergence of a high energy drink with a controversial name, "Cocaine." According to the makers of the energy drink, Redux Beverages LLC, Las Vegas, NV, it gives you a boost within five minutes, followed by a caffeine lift 15 minutes later. They claim that the legal buzz lasts five hours and the concoction is, "350 percent stronger than Red Bull." The firm argues that the effect is part chemical and part psychological. The drink includes simple sugars that do not need to be broken down by the body in order to create a sugar buzz, in addition to a much larger dose of vitamin B12. EZDropShipper.com has seen the product move at an increasing rate over the past several weeks. To make its company stance clear on the issue of illegal narcotics, the website states in the front page ad for the drink that it does not condone the use of illegal drugs. "It actually has natural ingredients and elements that make it a good drink for you health-wise," Maggio said. "Etailers have been picking it up at a good pace. We think it is going to be a good product for us. We said, 'You know, this is interesting. Let us see what happens with it.' And it will be interesting to see how it does moving forward."